2019 is finally here and for many people, that means going out and buying a new calendars. The residents at St. Helens Hall & Lodge however, opted for something a little more personal. During a recent arts & crafts session, participants made their very own 2019 calendar, with most of them being made as gifts to gift to family members. Residents could get as creative as they liked but most opted to personalise their calendars with pictures of themselves! “Our residents love having their photos taken and can’t believe how quick we can print them out”, commented Jackie Smith, one of the Activity Co-ordinator’s at St. Helens Hall & Lodge. 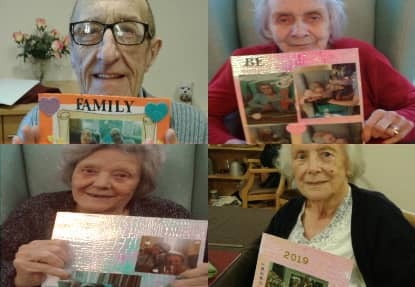 The arts & crafts session proved a fantastic bonding and sociable experience amongst residents, as making the calendars sparked a lot of conversation and memories about the past year. Participants also helped one another to complete their calendars, those who were more able, helped those who were blind or were having difficulty with making their own. “It was all so wonderful to see”, added Jackie.